Many businesses start out using a simple accounting solution that fits their small business requirements. However when their business takes off, so does the amount of information that the business generates such as – customer details, prices, orders, invoices, production, warehousing - all of which an accounting software isn’t built to handle. As a result, the solution that you think is working now may not be scalable and flexible to accommodate future changes. One of the most common options for growing businesses is to expand their operations by switching to a cloud-based ERP due to its ability to scale. And given the variety of options available in the market, there are a few key factors that a business leader should consider when choosing new software. 1. I want to make sure my employees have a good work-life balance. As your business grows and expands, so does the number of users that require access to your business information. Some ERP and accounting systems have a maximum number of users. This leads to credentials being shared or the system requiring one user to sign out before another user signs in. This can make activities that should take hours or minutes to do delay into days or even months, staff working overtime and ultimately, results in poor team performance. What you need is a system that can provide unlimited users and role-specific logins. Your team will be more productive when you allow your staff to access the system at any time they want and equip them with access rights that match their department needs. Your team won’t be drowned in work and will be able to maintain regular workflow while offering support during that critical time of the month. 2. I want my business to run fast. If your software slows down under a heavy workload, doesn’t update in real time or doesn’t correlate across applications, you could be facing database performance issues. This can hinder your business’ ability to access and manage financial transactions and inventory management, eventually bogging down your operations entirely. This needs to be addressed immediately as delaying is not only tedious, it can be costly. A cloud-based ERP solution allows you to add storage space at any time you need it. In addition, you won’t have to deal with the large upfront and ongoing investments to purchase and manage hardware, servers and facilities to run it so your business can focus on what it does best. 3. I want my core business system to be flexible. 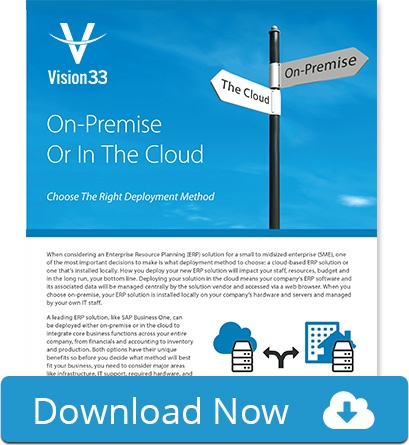 Many solutions can only be deployed on-premise, or only through the cloud. This limits your business’ ability to deploy systems - especially if your business requires a combination of the two due to varying technical infrastructures, geographic locations and any other reasons. An ideal solution will allow you to choose to have your ERP deployed through the cloud, on-premise or a combination of both. The traditional workplace isn’t so traditional anymore, and your work shouldn’t be disrupted because you’re on the road or working from home. You and your team can stay connected, productive and happy with a reliable cloud-based ERP system that provides the mobility and flexibility you all need to perform regular activities. To learn more about the mobile advantage of a cloud-based ERP, read this article. 5. I want to expand my company globally. Imagine expanding your business to another country only to find out that employees can’t use the system due to the language barrier or the system’s inability to support multi-currency functionality for buying and selling goods in other countries. Having a software limited to one language can be a breaking point when your company expands into international markets. With the business world getting more and more globalized, you require a solution that can process different kinds of currency but work in several languages and at different tax rates. 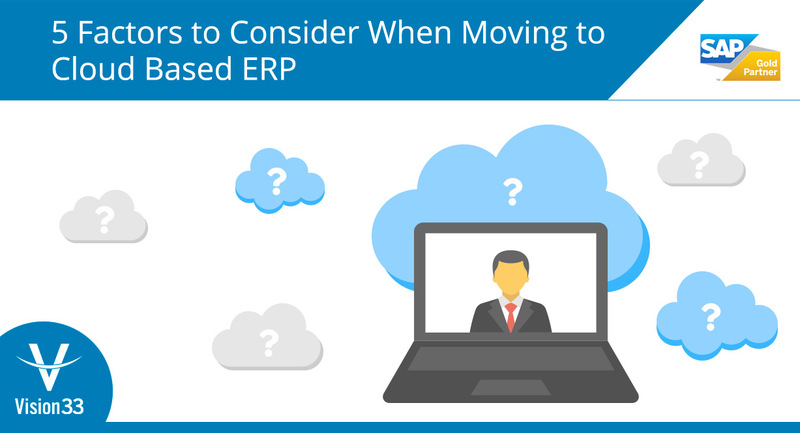 These are just a few of the factors to consider when you’re thinking of transitioning to a cloud-based ERP. There are plenty of other considerations when evaluating vendors, including cost and security. Regardless, the factors listed here are a good place to start as part of an effective ERP implementation strategy and planning process. Vision33 is a leading global SAP Business One reseller and an AWS Partner Network Consulting partner. Download our ERP Deployment Guide for more information on SAP Business One Cloud powered by Amazon Web Services and how it can streamline your business processes and improve decision-making in your company.